A few years ago, an editor emailed me and asked me if I would write an article for their website. My mom had been diagnosed with semantic dementia earlier that year (at age 50) and I began blogging about her disease a few months after her diagnosis. The topic they wanted me to write about seemed simple enough: they wanted to know how I had learned to love my mom after her dementia diagnosis. Piece of cake, I thought. My mom and I had always had a close relationship. I had always loved her; dementia didn’t change that. Certainly I could write about that love; no problem. Later that night, I opened the notepad that sat at my bedside, intent on writing down some flowery words of love for my mom. I held the pen in my hand and tried to collect my thoughts, but my mind came up blank. While I evaluated my topic assignment, I thought back to the mom that I had grown up loving; the mom who rocked out to “Queen” while doing her housework; the mom who nursed me back to health when I was sick and who came over every morning when I was in my first trimester of pregnancy to make me toast and help ease my morning sickness. I thought of the mom who made each birthday special by baking and decorating each of her kids their very own themed birthday cake. I thought of the mom who would wait up for me late at night after I’d gone out on a date (and would bask in my giddiness if it was a boy I’d liked); the mom who I’d crawl beside in her bed at night just to talk, staying until my dad finally kicked me out of the room. I thought of the mom who I could always turn to for advice. That was the person that I had loved so dearly. As I tried to make sense of these feelings and memories, I turned my thoughts to the person mom had become with this disease: the mom who missed my baby shower because she forgot and went out of town on a weekend trip instead; the mom who was too tired to spend time with her grandbabies. I thought of the mom who had abandoned me in my time of need, when my young son was battling a 105 degree fever and I was pregnant and so sick that I could barely get off the couch to care for him; mom was “too tired” to come over and help me. I thought of the mom who only talked about herself; the mom who never seemed to be listening on the other end of the phone when I talked to her; the mom who had no good advice left to give. If mom was not the master chef in the kitchen, the nurturer and matriarch of our family, the person I could depend on and talk to, then who was she? The mom I once knew and loved was gone and in her place was a stranger. The very qualities that I loved most about her had been sucked out of her from a disease called dementia. Without the attributes that made her mom, how could I love this shell of a person that dementia had left in her place? For weeks I racked my brain on how I could write on this topic. I pushed it to the back of my mind, arguing with myself that I was too busy to think about it “just now”. I rationalized that I didn’t need to prove my love for mom; I knew that I loved her and that was enough. Yet, I felt bothered that I couldn’t find the right words to express how I felt. Finally, one day, I faced the fear that had been haunting me: I didn’t know how to love my mother. I felt guilty and ashamed. How could I reconcile these feelings with myself? I felt like I had betrayed the woman I loved most in the world. I tucked these thoughts and feelings deep inside and tried not to think about it; I spoke of it to no one. What kind of insensitive monster could un-love their mother? I reeled in disgust of myself every time I allowed my thoughts to wander back to this topic. I didn’t write the article. To do so would be a lie. I couldn’t write on something that I knew nothing about, and the truth of the matter was that I didn’t know how to love my mom. In the pits of my despair, I decided that I needed to re-learn how to love my mother. She wasn’t the same mom that I loved before; all that was left of her were memories. Yet, mom was still here…physically. I turned my thoughts to all of the times that mom was there for me: during sicknesses and surgeries, nursing me back to health; during times that I felt sorrow or hopelessness; during times of joy and success. During our rocky teenage years and bad attitudes, mom never gave up on any of her children. 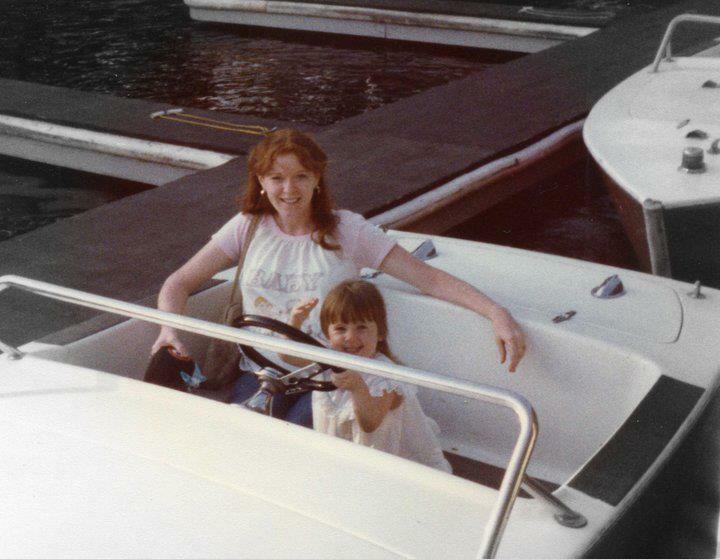 My mom was always there for me and loved me, no matter what. I knew that she needed me now; she needed me to love her and I couldn’t give up on her. I wish I could tell you that my love for my mom grew back quickly. The truth is, it was quite the opposite. As mom’s abilities declined, the need for supervision and care increased. During this time, I volunteered to coordinate a care-giving schedule for my dad and I signed myself up to “babysit” my mom on Mondays. It was the least I could do to help my dad and I was still weighed down by guilt over my lack of love. They say that you learn to love a person by serving them; I would serve mom until I learned how to love her again. They say that you learn to love a person by serving them; I would serve mom until I learned how to love her again. Some days were harder than others. From taking away the car keys to restricting her money access to wiping peanut butter and jelly off her face, mom was quickly becoming a child. So many times I would find myself making comparisons between the phases my mom was going through and the phases my own young children were in. If mom was caught doing something she knew she shouldn’t be doing, a mischievous grin would spread across her face and she’d try to cover her tracks. When she didn’t want to be bothered by me, she would hide in her closet-a similar game that my son liked to play. She resented me being there and giving her restrictions and I felt conflicted in our changing roles. That Christmas, nearly a year after I was first asked to write my blog post, I took mom Christmas shopping for my dad. We walked down one aisle after another until we had circled the entire store. The whole time, I prompted mom with ideas of things that dad might like to receive from her for Christmas; things that she’s gotten him in the past: cologne, t-shirts of his favorite bands, movies he liked. “Mom, you used to buy this every year for dad…he loves it! He would love it if you got it for him. You could wrap it and put it under the tree,” I said, as we came upon the Johnsonville sausage displays. It was as if she didn’t hear me. I waved the box of sausage in front of her but she wouldn’t look at it. She couldn’t recognize any of the things I presented to her. Instead of giving any of my ideas consideration, mom raced around the store, looking for something that was familiar to her. I chased after her, but she was fast. When I finally caught up to her, she was in the laundry detergent aisle, intently studying labels on the bottles of detergent. I wrinkled my eyebrows and looked at mom in confusion. “Mom, do you mean to say that you want to buy dad laundry detergent for Christmas?” I asked. “Yes I am, this is what he likes. I know he’ll really like this too ‘cuz it washes his clothes so good,” she said, tossing the detergent into the cart. My initial reaction was to put the detergent back on the shelf and make her pick out a “real” present for my dad. But I couldn’t deny the sheer look of contentment and excitement on her face. After searching the entire store, mom had found what she wanted to get her husband for Christmas; something she remembered that he liked. I thought about the sweet innocence of children and how the Christmas before, my daughter had found objects from around the house that she wrapped up and tucked under the tree for me. They were silly things, but things she knew I liked-a stuffed animal that I had given her which had belonged to my grandma, a pen and notepad because she knew I liked to write things down. As I reflected on that memory, I realized that mom had obtained those same, innocent qualities. An overwhelming sensation rushed through me and for the first time in a long time, I felt something. I felt pure, genuine love for my mother. That Christmas was one that our family will always remember. We all chuckled when dad opened his Christmas present. “Perfect. Absolutely perfect,” dad said, trying to contain the chuckles. I looked at mom and was filled with wonder; how could I have ever felt conflicted in loving her? It’s true- she isn’t the same exact mom that I had grown to love all those years ago. Our relationship isn’t the same. But my perception of her has changed. Instead of seeing her as the stranger that dementia has turned her into, I’ve learned to view her as a child and embrace her innocence. Perhaps I am even seeing glimpses of what she was like as a child. That Christmas was a turning point for me. When my viewpoint of my mom had changed, I felt a new sort of comfort in caring for her, and a love in which I can’t describe. Though I resent the disease, I do not resent caring for mom in the least. Rather, I think it is caring for her, and serving her, that deepens my love for my mom each day.